Get a unique aerial perspective of Brisbane as day turns to night with this twilight climb across the iconic Story Bridge! Scale the architectural landmark for a safe and thrilling adventure that lets you ascend the bridge’s sky-high platforms above the Brisbane River and a 6-lane expressway. Watch the city’s twinkling lights come on as the sun dips below the horizon, while audio commentary provides insight into spectacular views that include the Glasshouse Mountains, Mt Coo-tha and Moreton Bay. Brisbane’s iconic Story Bridge claims a spot on the Queensland Heritage Register and has been celebrated as a local landmark since its completion in 1940. To begin your 2-hour climb, make your way to Kangaroo Point in downtown Brisbane in the early evening. 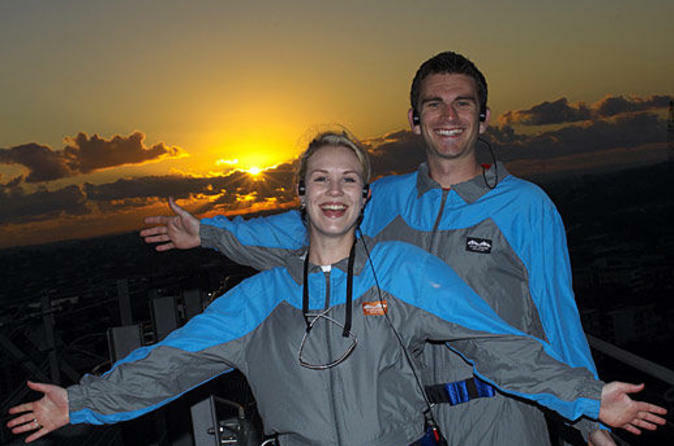 Prepare for the ascent by donning a protective suit and belted harness, and take part in a brief safety training. Once ready, begin climbing along a series of staircases and platforms with handrails. Listen to audio commentary through a provided headset to learn about the history of the cantilevered bridge and attractions within view. After you make your way along road level, a steep incline takes you to the first of two summit platforms — the highest points on the bridge at approximately 262 feet (80 meters). Pause to take in panoramic views of Brisbane and natural attractions on all sides, including Moreton Bay, the Glasshouse Mountains, Mt Coo-tha and Lamington National Park. Descend from the first summit, and walk along a relatively flat section before climbing up to the second peak. As you go, watch the city skyline shift in the changing light of dusk as color fades from the sky and countless lights illuminate the landscape. As no cameras are allowed on the climb, a photographer will snap your photo at several vista points throughout the climb; you’ll receive three high-resolution images to take home as a memento of your Story Bridge adventure!